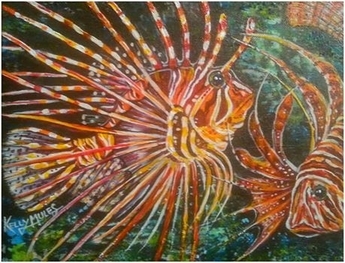 "Colorful Sea" This is a very colorful piece full of texture and personality and would look awesome in a custom cut mat and frame! 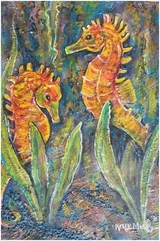 Signed and numbered print is approx. 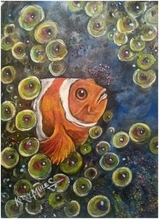 6" x 9"
"Hiding in Anemone" This is a very colorful piece of a clown fish hiding in a safe place. 8.5 x 11...$15 plus s/h. 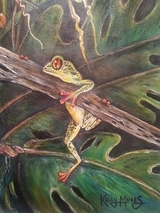 "Out on a Limb" Inspired from my love of plants and when I use to work in a greenhouse I would find these cute little tree frogs on the plants and try to rescue them. 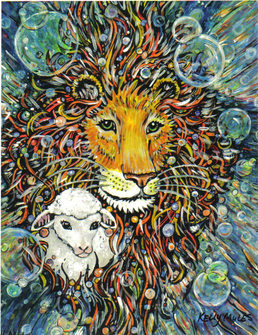 "Billy Goats Gruff" Original is done in mixed media and embellished with beads. Please call for pricing. Prints are also available. Mixed media. 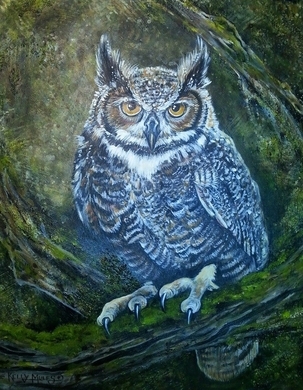 Inspired from a great horned owl that was rehabbed and I got to watch get released back into the wild after being stuck in a barbed wire fence. 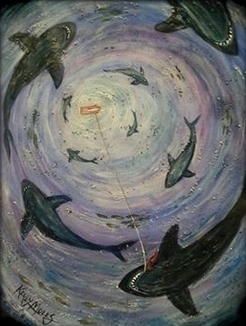 All prints are signed and numbered and are done on canvas. They will have a white border around the art and ready for framing. 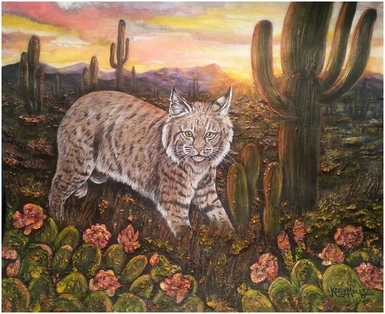 "Where the Heavens meet the Earth"
This beautiful bobcat is done in mixed media, acrylic and colored pencil and has lots of texture and color to it. All prints will have a white border and are signed and numbered prints. 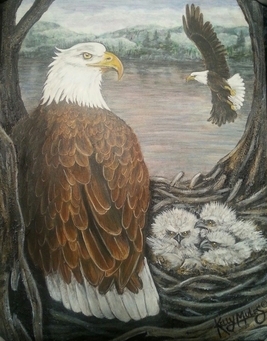 This painting was Inspired from a hike I go on every Spring to see these beautiful bald eagles. They have been nesting in this area for years. I hike up to the edge of a cliff and am able to look down on the nest in a big old tree overlooking a lake. This year they had 3 eggs and they all hatched and grew up and flew away. 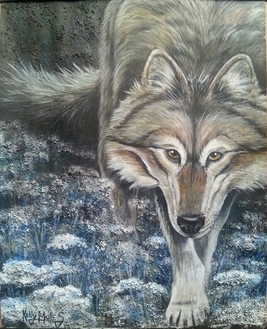 I love the wild flower called Queen Anne's Lace and thought it would be the perfect place to paint this timber wolf softly walking in the moon light. This piece is inspired from just trying to put on paper how beautiful the Holy Trinity must be to see. The Father, The Son and The Holy Ghost.